CooksRecipes has quality, kitchen-tested recipes for salads featuring potatoes as the main ingredient, including sweet potatoes. 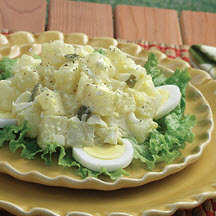 Recipe courtesy of DeAnne Wilkins whose husband is a former Idaho Potato Commissioner. 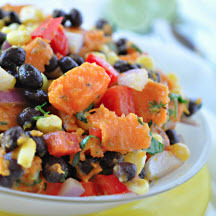 The combination of roasted sweet potatoes, corn and black beans in a light jalapeño dressing makes for a tasty explosion of flavors and colors. 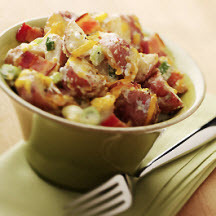 A hearty, roasted red potato salad with crisp smoked bacon, green onions and shredded aged cheddar cheese, simply dressed in sour cream.